As long as we’re making dinosaur-shaped mechanical behemoths, why not go all out and make them even more terrifying? This is where the Empire is lacking in creativity. They shouldda put jaws on these things with hundreds of sharp teeth and given them faster motion so they can run after the speeders. They can still take the things out the same way, it just wouldda been more exciting. 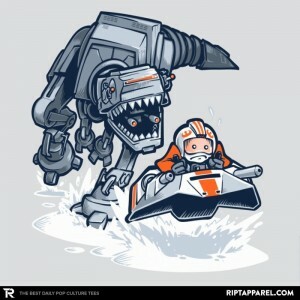 All that said, I think we’re due for a mashup of Star Wars and Jurassic Park, eh? I’m not even sure what that would look like, but there are enough creatures in Star Wars that dinosaurs wouldn’t feel out of place. Hell, we’ve seen dinosaurs in Star Wars. Wrap this cloth around your torso and live the dream.